House enclosed garden, 2wc. Ideal central location to visit all of Alsace. Whether you are in town or country, the rental is ideally placed to allow you to fully enjoy your stay and visit a maximum of Christmas markets. 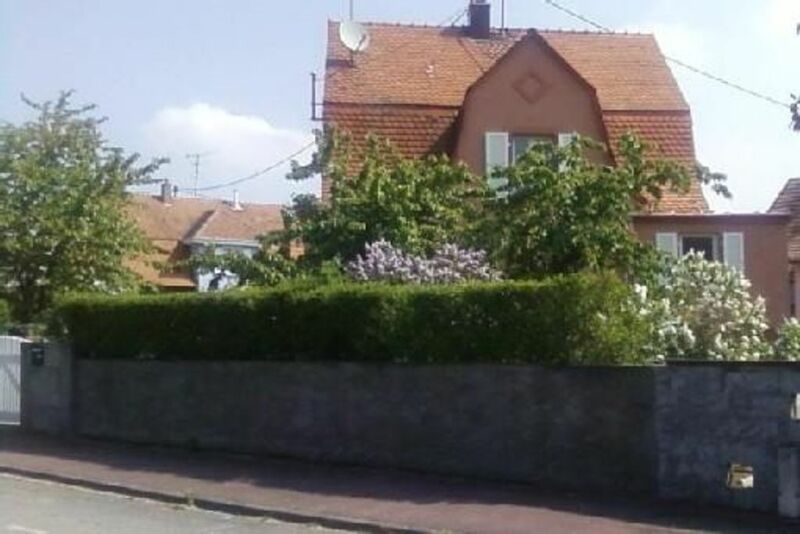 At 60m from the cottage, a pizzeria, forest trails and bike path for routes on the Romanes road Véloroute the Euroroute, IL circuit, Hardt and Rhine, or along the Thur is facing or towards Ried Massevaux the valley. - The road of the Rhine, to cross the Hardt and walk along the Rhine home an exceptional fauna and flora. - Neuf-Brisach, the city of Vauban part of the heritage of UNCESCO, which offers guided tours with a costumed guide. - Germany just on the other side of the Rhine. - The Little Prince Park with its 31 animations and two balloons (balloon) for a view of the Vosges, the Black Forest and the Alps. - The valley of Florival with its museums and numerous hiking trails, the Wine Route and the many wineries, the ridge road and Hartmannswillerkopf (historic site with a necropolis and hiking in the trenches to the discovery of the remains ), the vivarium Lautenbach and the nature of the Ballons des Vosges, with the small ball and ski resort 25km Markstein. - Eguisheim, the village preferred the French, and above, the Hohlandsbourg Castle back in time during the medieval animations or a fancy banquet. - The Munster Valley with the road of cheese. - Mulhouse with the Automobile Museum, the Museum of Printing and the city of the Train. - The Thann valley to cross over the green hills, through villages in the past steeped in history, and visit museums and historical sections traditions of Alsace. - The border region with its museums and its classified nature reserve 'Petite Camargue', which also includes a bird wintering area. - Colmar and his little Venice, its architectural, entertainment, and museums with the world famous Isenheim Altarpiece. - Many medieval cities such as Kaysersberg, Ribeauvillé or Riquewihr. While only around 50 km find the famous towns and villages such as Selestat, Erstein, or Obernai. - More than 60 museums and numerous parks like Cigoland. - The Europapark theme park in Fribourg. The house has a kitchen, a living room and 2 bedrooms (5 individual beds possible). The rental is equipped with a cellar for bicycles and the garden has a terrace and a parking space. The cottage is non-smoking; Pets are allowed after agreement of the owner supplement 15 € stay .. The house is very well exposed and sunny all day. The garden is fully enclosed with a parking space. The terrace and garden furniture are naturally shaded by the surrounding vegetation. The cellar can receive up to 6 bikes. Ce fut un plaisir de vous avoir accueilli dans mon gite. Ungersheim is known to be a village in transition .. you will find farm markets and organic products. In May, the traditional pig festival brings together music, gastronomy, parties and entertainment. At 60 meters from the cottage, a pizzeria, forest trails and country roads. Ungersheim is crossed by a bicycle path on the cycle route to travel around the Euroroute, the greenway and the Roman road. A Ensisheim town with all shops, artisans and shops, is the Regency Museum and Eiblen Park, home to storks and many other animals, it is also the venue for summer concerts. Cross on the wine route, or go trekking in the Natural Park of Vosges which is 7 km. Within 45km, several military sites with tours and walking routes to meet the first and second world war, or enjoy a day in the Europapark theme park in Fribourg. Option ménage 50€. Ménage fin de séjour 70€ Obligatoire pour les séjours de plus de 15 jours.